Hello. 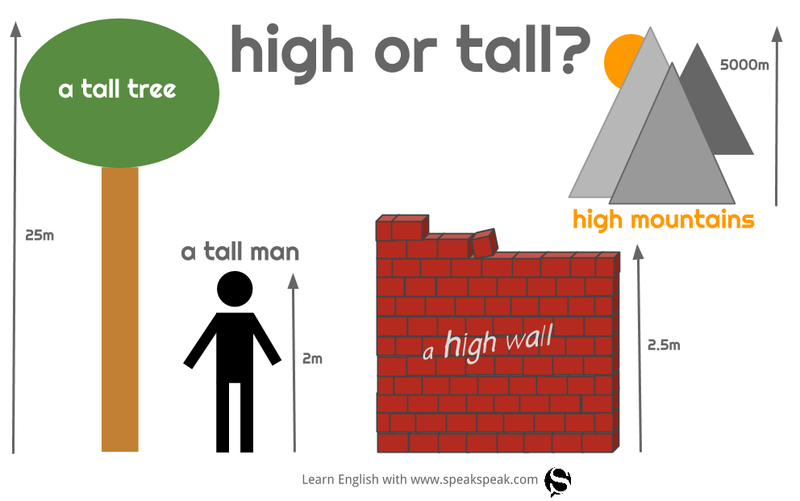 In this post I’ll be looking quickly at the difference between high and tall, two commonly confused adjectives in English. High is used of most things, especially to talk about the distance above the ground, i.e. how far something, or its top, is from the ground: a high shelf| a high mountain| The shelf’s too high, I can’t reach it. We use tall mostly for people, trees, buildings with many floors, and a few other things which are high and narrow (they are higher than they are wide), especially when you’re thinking of the complete distance from top to bottom: a tall building| a tall tree/column/vase/fridge/bottle| a tall man. In measurements, we use tall for people, but we often use high for things: Michael’s six feet tall| That tree is about eighty feet high/tall. Walls are always high, not tall. English, like all languages – though maybe to a greater extent -, is full of words with similar meanings and different usage, which can cause problems for the foreign learner. One of those common vocabulary problems I’ve seen over the years (especially at elementary and pre-intermediate level) is the use of alone and lonely. In this post I’ll be looking quickly at how we can use these words to avoid mistakes. Sally’s fine when she’s alone for a day or two. But after that she starts getting really lonely/lonesome. Alone is not normally used attributively (before a noun). Lone and solitary can be used instead; lone is literary. There was a lone/solitary tree by the road. Hope you found it useful. Hello and welcome back to A phrase a month – after a longer break. As the weekend’s drawing near, some of you will probably choose to have a lie-in on Saturday or/and Sunday morning. Many of us get up really early in the week (Monday to Friday). So, for most people weekends are a chance to switch off and the best way to start is to have a lie-in, i.e., to stay in bed longer than usual in the morning … if you can. Some of us work Saturdays (or Sundays) as well and it just isn’t possible. For others still it’s their body clock. When you’re used to getting up early in the week, your body may prompt you to do it at the weekend even when you’re not going to work. Here are two examples : Jenny often has a lie-in on Saturdays. | I’m not working tomorrow, so I can have a bit of a lie-in. Regardless of whether you’re a late sleeper and love having lie-ins or you wake up early at the weekend because you go to work or you’re simply a morning person and you don’t like getting up late, you can now add this new phrase to your vocabulary and learn it. Hello and welcome back to A phrase a month … just in the nick of time. Today’s January 30th, the last day of the month and my post arrives late but not too late. Indeed, it gets here at the last possible moment, just before it’s too late. That’s what the phrase in the nick of time means. Sometimes a just is used before it or a very is inserted in the middle to make it more emphatic: just in the nick of time or in the very nick of time. Here are some examples: The doctor arrived in the nick of time. The patient’s life was saved. | I reached the airport in the very nick of time and made my flight. | We got there just in the nick of time. A minute later and she’d have left. Right. That’s all from me today and I’ll leave you with what seems like a good thought on which to end: sometimes things happen at the last possible moment but they do and, who knows, they probably do so for a reason. What is Christmas? Sounds like a stupid question. Everyone knows what we celebrate on December 25th. You don’t have to be a Christian to be able to give an answer. But where does the word Christmas come from and what does it mean? „Christmas” is a shortened form of Christ‘s mass. It is derived from the Middle English Cristemasse, which is from Old English Crīstesmæsse, a phrase first recorded in 1038. Crīst (genitive Crīstes) is from Greek Khrīstos (Χριστός), a translation of Hebrew Māšîaḥ (מָשִׁיחַ), Messiah, meaning anointed and mæsse is from Latin missa, the celebration of the Eucharist. In English therefore the profoundly religious meaning of the name of this great feast is more transparent than in other languages. As the celebrations are now being held around the world, amidst the merry making and the gift giving, the name of this holiday is there as a reminder that a Christmas without Christ does not make any sense. Small words: prepositions, articles, auxiliaries, quantifiers, determiners. They crop up everywhere. We hardly ever make a sentence without using at least one of these. Yet, they don’t add much to an utterance. In fact, some of them mean nothing at all. We call them fillers because we can understand a sentence without them. Take this for example: Jenny is going back to school tomorrow. The words in bold are an auxiliary verb (the verb be which helps us make the Present Continuous) and a preposition, respectively. Leave them out and you’d still understand what that statement means – a girl, Jenny, is returning to school tomorrow. That’s because the other words (Jenny – a proper noun -, go back – a verb -, school – a noun – and tomorrow -an adverb -) carry the main information in that statement. Leave these words out and you wouldn’t understand anything. This means that the words in bold have a purely grammatical function. One of these small words I’d like to look at today is any. This word is used in various ways in English, but in this post I’d like to focus on the use of any with plural nouns in yes/no questions, i.e. questions you can answer with either yes or no. Here are some examples: Have you got any children? | Are there any apples in that basket? | There aren’t any eggs in the fridge. Please note that in our mother tongue (Romanian) we don’t use a word like that with plural nouns. We simply say: Ai copii? | Sunt mere în coșul acela? | Nu sunt ouă în frigider. For this reason, if we translate from Romanian into English we might say Have you got children?, which just doesn’t sound right in English. The same is true of the other two sentences: Are there apples in that basket? | There aren’t eggs in the fridge. All three sentences are wrong because I’ve left out the word any. It’s one of those common mistakes we find in our experience as English teachers, so that’s a thing to avoid from now on. Next time you speak or write in English, use any with plural nouns in yes/no questions or in negative sentences. Hello, I’ve decided to rename this post series A phrase a month because I just can’t find the time to write even a short article like this every week. That said, in my last post I looked at the phrase feel run-down (be in a poor physical condition, weak or exhausted, like during a cold or some other illness or from too much work). Run-down is an adjective obtained by conversion from the verb run down. Like many other phrasal verbs, this one has more than one meaning. Today I’ll be looking at one of them. When you run somebody down you disparage them, you criticise them (often in an unfair way), you speak slightlingly of someone, you belittle them. Here are two examples: Don’t run her down! She’s very talented. | Please, stop running me down all the time! Do any people you know sometimes run you down? Do you do it to others yourself? We usually run people down to make ourselves feel better. It doesn’t really work, of course. We don’t get well by doing that. As St. Ambrose of Milan used to say: No one heals himself by wounding another. There’s a man and he’s lost in the desert. His plane crashed or something – in the desert. And he hasn’t got any water. So he’s walking and walking, and he’s really thirsty. After a while he meets a man who’s selling ties (the things that men wear round their necks). So this man has got hundreds of ties –black ones, pink ones, striped ones. Do you want to buy a tie sir? Lovely ties, very cheap. So the man who’s lost says No, I don’t want a tie – I want water. Sorry sir, no water, only ties. So the man walks on in the desert. And he’s getting more and more thirsty. Then he meets another man. Want to buy a tie sir? Lovely ties. Special price for you sir. And he says No!! I don’t want a tie. I want water. Sorry sir – no water, but very beautiful ties. So he walks on again. It’s very hot and he’s really desperate for water now. And he sees another man Give me water! No water sir. But beautiful ties. Pink ones, red ones, striped ones. Very good price. So the poor man walks on. And then, right in front of him he sees a beautiful luxury hotel in the middle of the desert. He thinks he must be imagining things, but no, it really is a hotel. He goes up to the door, crying with happiness and the man at the door of the hotel says … Sorry sir. You can’t come in here if you aren’t wearing a tie. Anyway, things were looking up on the third day and he recovered quickly. Still, with the cold season coming on, viruses will spread and many of us have already had some contact with them, even if in a mild form. So, how does your body react when you catch a cold or come down with the flu? Do you feel run-down? While an uneventful winter (from a medical point of view of course) is very unlikely for most of us, I wish you one with fewer medical problems.